That’s great! 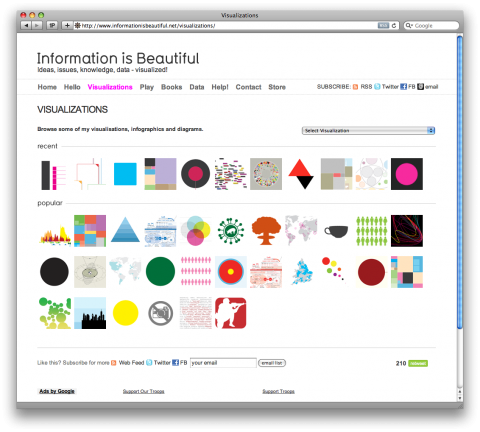 I am a big fan of McCandless’ work and am in full belief that information design is the way of the future (creative capital) and should have a place in education systems. How great would it be if high schoolers could, instead of Algebra 2 or Precalc, take “Math Information Design” as a class. I think McCandless’ work is evidence that there is utility in promoting design for non-designers. 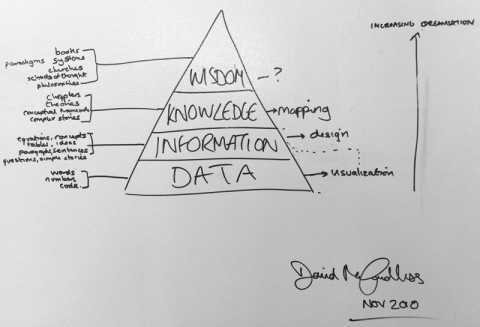 This is a useful model that can be stretched by adding at least one additional level near the top: Insights reside in the space between knowledge and wisdom. For this purpose, let’s define insights as the ability to reason from current knowledge to generate additional knowledge, to connect beyond the current experience. Insights may be glimmers of wisdom, but one can have insights without being fully wise. Putting the example to use, Columbus had insights about geography that enabled him to uncover (or recover prior) knowledge about the shape of the Earth, yet an expected circumference of 8,000 miles so limited his globe that he mistook the New World for a slice of Asia.